Daneille is a member of Weld Riley, S.C.’s Litigation Section, focusing her practice on worker’s compensation defense, creditor’s rights, foreclosures, and collection efforts on behalf of credit unions, banks, and businesses. She specializes in post-Judgment collection activities such as garnishments. She also represents landlords in various landlord-tenant matters and handles insurance defense claims. Daneille is a University of Wisconsin-Eau Claire graduate who received her law degree from Hamline University School of Law in St. Paul, Minnesota. There, she was selected among the top ten orators of her law school class while also being a member of the National McGee Civil Rights and National Health Law Moot Court teams. In 2011, Daneille was voted “Mover and Shaker” of her Leadership Eau Claire class. 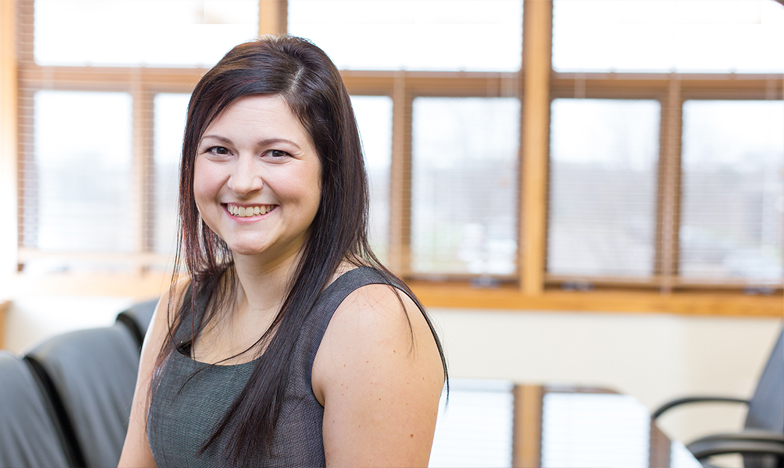 In 2015, she was recognized as the Networker of the Year for the Young Professionals of the Chippewa Valley, and in 2017 she was named Outstanding Young Professional. Daneille is a member of the American Bar Association, Wisconsin Bar Association, Eau Claire County Bar Association, and is a member of the Eau Claire Area Chamber of Commerce Board of Directors, a committee member for the Young Professionals of the Chippewa Valley, the Youth Leadership Eau Claire program, and the Business Challenge for Junior Achievement. She also volunteers her time to Alpha Xi Delta and Autism Speaks. A mother of four, Daneille married her college sweetheart in 2011. She spends her time with her identical triplet daughters and chasing Gus, her German Shorthair Pointer.